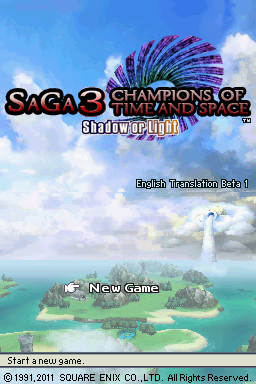 A public beta patch for SaGa 3 for the NDS has been released. This patch has all the menu and script text translated that is necessary to play the game from start to finish. Any bugs, typos and engrish should be reported so the script can get cleaned up for a final release. This is great news! I thought the possibility of this game being translated was gone since the translation group that was doing it in the first place (the same group who translated saga 2 for DS) dropped the project, tired of some people's massive bitching and whinning. This makes me incredibly happy. This is my favorite game in the series and I was really bummed when the translation project was initially dropped. I'm super excited to see it was picked up and is well on its way. I'm not that hard to find... if you know where to look. wow...it is finally released !! i have always been a big supporter of the translation for a few years now. really looking forward to clearing all of the extra "new game+" and "hard mode" content. thank you my friends Cain, cidkramer, DarthNemesis, Easton West, Rico, Sacred Nym, Secret Skeleton, and tehwes. i know life can really slow down the progress of a great RPG-Translation...so thanks for never giving up ^_^"
That doesn't surprise me. Back when I was working with Crimson Nocturnal on SaGa 2 that was the main issue the group had- constant arguing and whining. I finally left after a groupwide collapse over what the item text for the Seven Sword should be. What sayest thou, o fool? I say that religion hath done my bidding for me- while ye pretend free will exists, ye take it away and convert by force. Such is ye, who do my work. Seriously? I must not have been around for that. Probably a good thing. Anyway, Cain just put out a Beta 2 patch out to fix some overflows, bad translations, and a missed translation in the item notes menu. oh wow, i'll have to take a look then ^_^"
for some reason...this game never gets old !! I am ecstatic over this. NDS RPGs tend to be amazing, and seeing another added to the list of English releases makes me quite excited. There was some top-notch translating on SaGa 2. I, for one, will definitely be keeping an eye out for any engrish. I have the good. Heres hoping for an update to support the good md5. How can I download the patch? You uh... go to the RHDN page and download it? The download is still live in the database.